Monks should love silence at all times, but especially during the hours of the night. Therefore, on all days, whether of fasting or otherwise, let them sit down all together as soon as they have risen from supper (if it be not a fast-day) and let one of them read the Conferences [of Cassian], or the lives of the Fathers, or some thing else which may edify the hearers. Not, however, Heptateuch, nor the Books of Kings for it will not profit those of weak understanding to hear those parts of Scripture at that hour : they may, however, be read at other times. If it be a fast-day, then a short time after Vespers let them assemble for the reading of the Conferences, as we have said; four or five pages being read, or as much as time alloweth, so that during the reading all may gather together, even those who may have been occupied in some work enjoined them. Everyone, then, being assembled, let them say Compline; and when that is finished, let none be allowed to speak to any one. And if any one be found to evade this rule of silence, let him be subjected to severe punishment; unless the presence of guests should make it necessary, or the Abbot should chance to give any command. Yet, even then, let it be done with the utmost gravity and moderation. 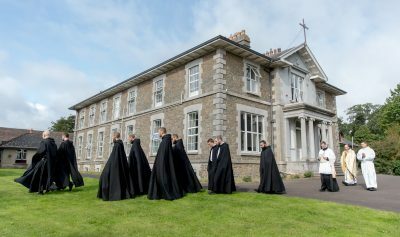 Monks should love silence at all times, but especially during the hours of the night. . . . And if any one be found to evade this rule of silence, let him be subjected to severe punishment; unless the presence of guests should make it necessary, or the Abbot should chance to give any command. Yet, even then, let it be done with the utmost gravity and moderation. Saint Benedict’s directives concerning the evening reading come between the first and last sentences of the chapter. Saint Benedict says, Omni tempore silentium debent studere monachi, maxime tamen nocturnis horis. Abbot Hunter–Blair translates this: “Monks should love silence at all times, but especially during the hours of the night.” I rather like the strength of Abbot Hunter–Blair’s translation because I think it attempts to sum up all the many shades of meaning of the verb studeo. Lewis and Short give no less than nine different but related meanings for the word studeo: to be eager or zealous, to take pains about, be diligent in, anxious about, busy one’s self with, strive after, to apply one’s self to or pursue. 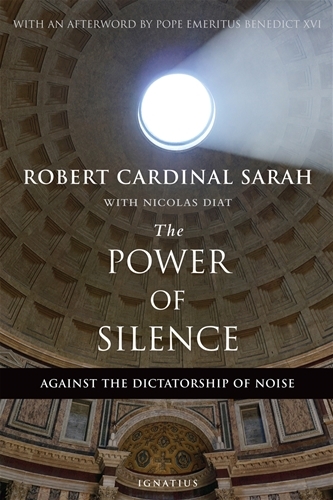 What emerges clearly from the text is that monks ought to to be eager or zealous for silence; to take pains about silence; be diligent in keeping silence; anxious about silence; busy themselves with silence; strive after silence; apply themselves to silence, and pursue silence. In human affairs whatever is against reason is a sin. Now it is against reason for a man to be burdensome to others, by offering no pleasure to others, and by hindering their enjoyment. Wherefore Seneca [Martin of Braga, Formula Vitae Honestae: cap. De Continentia] says (De Quat. Virt., cap. De Continentia): “Let your conduct be guided by wisdom so that no one will think you rude, or despise you as a cad.” Now a man who is without mirth, not only is lacking in playful speech, but is also burdensome to others, since he is deaf to the moderate mirth of others. Consequently they are vicious, and are said to be boorish or rude, as the Philosopher states (Ethic. iv, 8). (Second Part of the Second Part, Q. 168, art. 4). There are, I think, three kinds of silence in the life of a monk: the first is ascetical; the second is useful; and third is contemplative. By the first, a monk seeks to avoid sins of the tongue and the occasions of such sin. By the second, a monk practices silence as the means to a worthy end; as when, for example, one is silent in order to stay focused on one’s work, to study with application, or to prepare oneself for lectio divina and for prayer. By the third, one is silent because the presence of God reduces one to silence, that is, to the silence that is the soul’s expression of adoration, of yearning for God, and of repose in His love. The third kind of silence is best learned in the school of the Host. I know of no better place to be silent than before the Host. The silence of the Host stills every other voice, and quiets every tumult. The silence of the Host reveals the presence of the living God who holds Himself in a permanent state of readiness to receive all who approach Him. It is not uncommon for a man to be intimidated, or uneasy, or anxious when first he finds himself defenseless in the silence of the Host. There will be a temptation to escape, or to begin holding conversations in one’s head, or to seize upon thoughts like a drowning man seizes a floating piece of debris. One must, rather, let oneself sink into the ocean of the silence of the Host. The devil may whisper that the silence of adoration is a waste of time: one could be thinking, or speaking, or doing, or working away, or getting on with life. The man drawn on by the silence of the Host is like the prophet Elias who stood in ostio speluncæ “in the entering in of the cave”. All of these other things which Jesus did, and continues to do, are found in the silence of the Host. In a sense, the silence of adoration of the Most Blessed Sacrament begins precisely where the Gospel of Saint John ends.